This lovely dollhouse miniature "For You" Fruit-Topped Cake is 1:12 scale and would make a fantastic addition to your dollhouse miniature collection. This cake has white icing with "For You" written across the bottom in red icing has several varieties of fruit decorated on top of the cake. It also comes on a white doily. 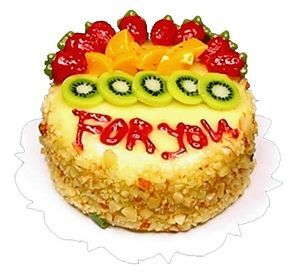 This "For You" Fruit-Topped Cake is supplied by Bright deLights Miniatures, which generally ships within 12 business day(s) of you placing your order .